Although, news on Facebook is already broken. Facebook will set a cookie to keep you logged in, but it won't set one to remember whether you want to stick with a chronological News Feed. That sort of thing makes it hard to tell at a glance how old a story from a media outlet in your Feed might be. To counter that, the social network is giving certain publications access to a "breaking" tag for their posts. The bright red tag sits below a post's image and highlights how long ago it was published. Recode writes that publishers will be able to flag a story for between 15 minutes and six hours, and that it can be used once every 24 hours. For now, the list of publishers who can use it is small and includes ABC News and Vox Media, and Facebook is keeping the full list of media organizations involved close to the chest. The breaking tag won't weight a post's ranking within Facebook's algorithms. At least not yet. A spokesperson told Recode that part of the test was to decide whether or not a breaking news story should have preference over other posts in the News Feed. 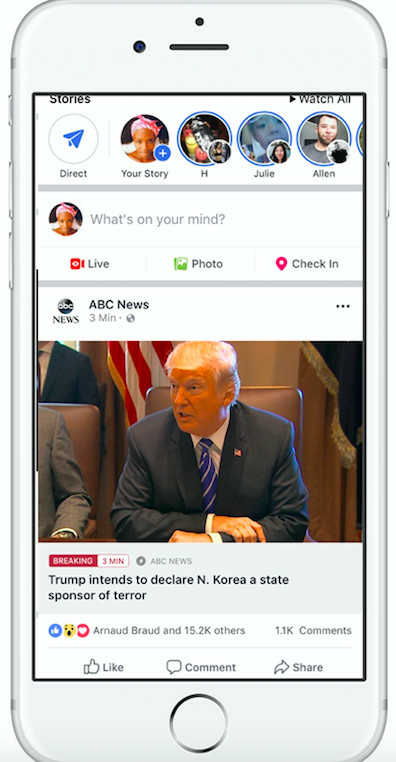 Facebook has been working with news organizations on different ways to post, host and promote their stories for awhile. Instant Articles, for example, were fast-loading versions of news stories hosted by Facebook, made their debut a few years ago. Then there's the split News Feed that keeps posts from Pages and friends siloed off from each other, and the Explore Feed. We've reached out to Facebook for more information and will update this post should it arrive.